With a few days of rain showers, cooler temperatures in the forecast and crispness in the air, it's easy to feel like fire season is over. Now is a great time to do some yard maintenance, clean up your house and do some burning of yard debris piles. Right? "You can do that if you want a ticket," joked Kelly Niles, a Wildland Fire Supervisor for the Columbia City unit of the Oregon Department of Forestry, joked. While the Columbia County area has experienced some rainfall over the past week, fire officials warn that that fire season is still in full swing and burn bans remain in effect. Residents may have campfires and contained recreational fires in their yards, but backyard burns remain off limits. Niles is also a member of the Columbia County Fire Defense Board, a team made up of fire chiefs from all fire agencies in the county that monitor fire conditions and decide when burning is allowed or prohibited. Niles noted that, in Columbia County, the leading cause of fires is escape from debris burns. In 2017, a total 39 human-caused fires burned nearly 55 acres in ODF's Forest Grove District, which contains Columbia County for reporting purposes. Two fires were caused by lightning last year, covering only a fraction of an acre. So far this year, no lightning-caused fires have been reported while there have been 30 human-caused fires covering almost 46 acres, he reported. In June, a fire near Chapman Grange Road covered nearly 42 acres, and ODF officials at the time warned of extremely low fuel moisture levels in the region after little rainfall was reported in May. The ODF 10-year average shows that 24 fires have been caused by lightning covering six acres, while more than 300 fires have been human-caused. Those fires have burned 427 acres. While the 2018 numbers may be down slightly, Niles said it's somewhat of an anomaly, speculating that people could be being more careful following last year's Eagle Creek Fire, which burned in the Columbia River Gorge, he mused. Either way, Niles said, residents should continue to use caution. Scappoose Fire District Division Chief and Fire Marshal Jeff Pricher also noted that long-term heat dries out fuel sources, not only during a single year, but over longer periods of time. "We haven't gotten the moisture that we typically do. Snow pack was low this year and it melted a lot faster. 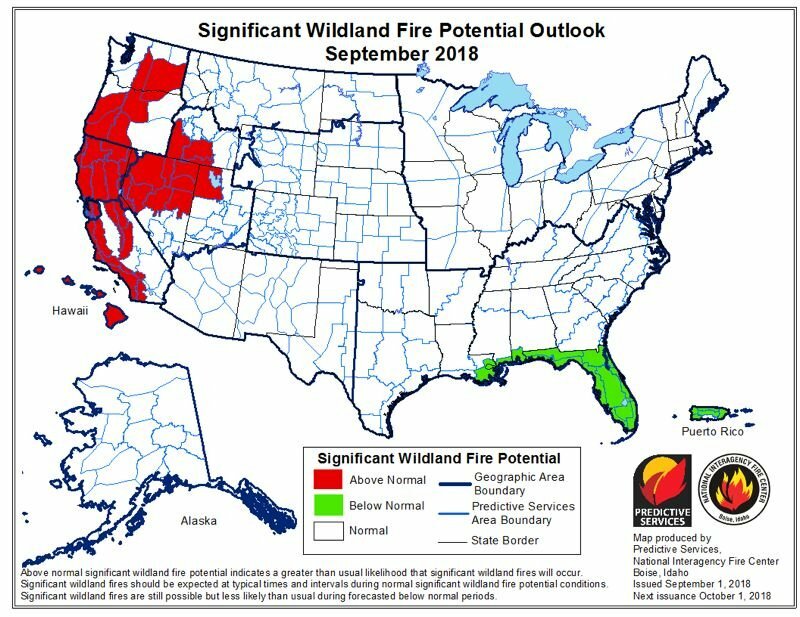 We've had a couple summers where fuels have been cured for a significant amount of time, and without the lack of thinning and combination of encroachment of residential living and the urban interface environment, it's created a unique situation and real challenge for all fire agencies," Pricher said. From Sept. 10-12 this week, measurable rainfall collected at a remote access weather station in Mist-Birkenfeld area by OD measured only a quarter of an inch over three days. While cooler temperatures and some rainfall are forecast to continue this week, Niles noted that warmweather is expected to return next week. Pricher added that a few days of rain may help dampen small foliage like grass and brush, but larger fuel sources, such as branches and large trees, take longer to adjust to changes in moisture. National fire agencies and environmental groups use fuel moisture indexes to determine how quickly a fuel source responds to moisture changes. A tree log that measures between 3 and 8 inches, such as a fir or oak tree, would be referred to as a 1,000-hour fuel source. While the fuel source might not burn quickly or easily, when it does, it generates extreme heat. Niles said he always recommends calling the local fire agency even when burning is allowed to make sure it is a permitted burn day.